With the 2014 FIFA World Cup kicking off today in Brazil, and England’s first game – against Italy - fast approaching on Saturday, this seemed like a very good moment to look at the last time England hosted, and then won the contest, way back in 1966. 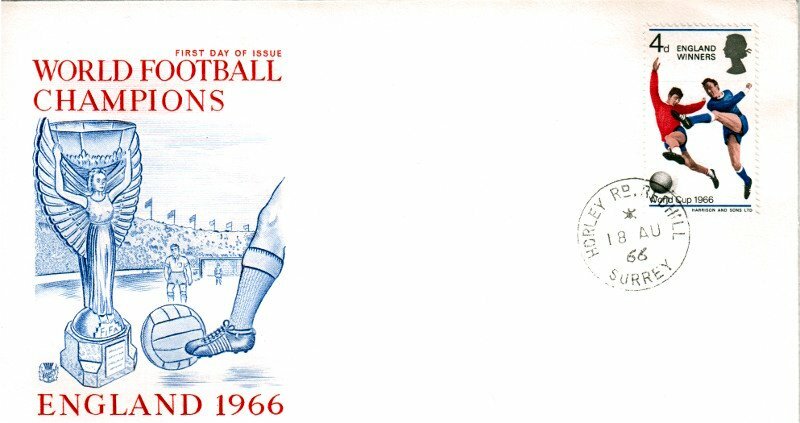 The General Post Office issued its first ever set of football postage stamps on 1 June 1966 to commemorate the event. The 6d and 1/3d value stamps both depict goalmouth scenes and were designed by William Kempster and David Caplan respectively, although the striking 4d value stamp designed by David Gentleman, and based on sports photographs taken by Peter Boyce, became the most iconic image of the three. With over 130 million stamps of the 4d value issued alone, the set is hardly rare and can easily found today, but it’s still a great piece of philatelic sporting memorabilia. The official special First Day Cover above is cancelled with three Counter Date Stamp (CDS) Stratford postmarks, although the 1 June 1966 date is frustratingly blurred in each of them! When Alf Ramsey's England team went on to beat West Germany in the final on 30 July 1966, the GPO clearly hadn’t planned for this, and to mark the occasion simply reissued David Gentleman's 4d value design with an “ENGLAND WINNERS” overprint. The print run on this issue ran to nearly 12.5 million. 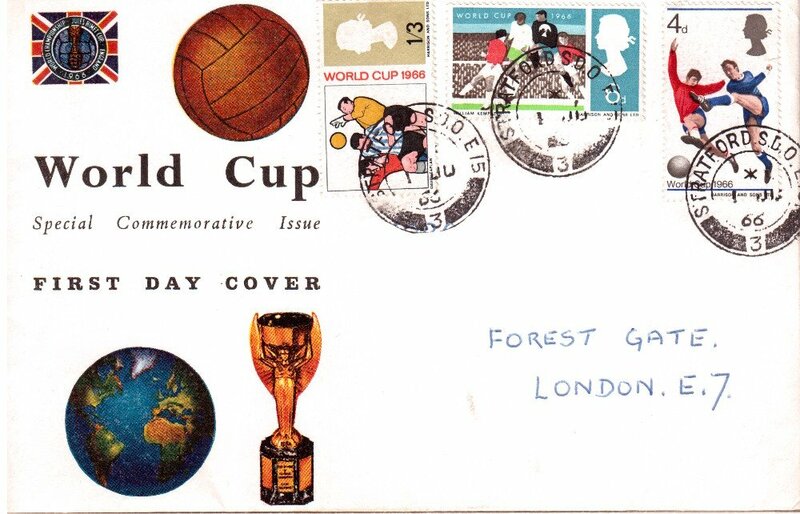 The England Winners stamp was issued on 18 August 1966, and this First Day Cover carries a very clear postmark from Horley, Redhill. This is a “Stuart” First Day Cover - the company’s distinctive thistle logo is seen in the left hand corner of the envelope. We just beat Germany in a friendly again 3-2. Would love to see some stamps of the modern footy team if they can win the Euros. Great post.